March 31, 2011 - Bombardier Aerospace announced that it has entered into a strategic alliance with Fokker Services for the launch of FLY, a new program aimed at improving the availability of components and reducing the cost of repairs for Dash 8/Q-Series 100/200/300 aircraft operators. The program will also help operators to better predict and budget for material maintenance. Fokker Services' FLY program will offer operators guaranteed availability of serviceable components, a factor that will appreciably extend the longevity of out-of-production Dash 8/Q-Series 100/200/300 aircraft. The program also provides customized component repair and overhaul services on a cost-by-the-hour basis, allowing operators to better manage the life cycle cost of their aircraft. "Bombardier's Dash 8/Q-Series aircraft program is one of the most successful regional airliner programs in history. Our aircraft are operated by more than 100 airlines around the world, and the collaboration between Bombardier and Fokker Services for the FLY program is further proof of Bombardier's commitment to providing its operators with comprehensive support for their aircraft long after production is discontinued," said James Hoblyn, President, Customer Services & Specialized and Amphibious Aircraft, Bombardier Aerospace. The service is modeled on Fokker Services' well-established and highly successful ABACUS cost-by-the-hour program, which has been bringing cost predictability and parts availability to operators of post-production models for 17 years. Under the FLY program, Fokker Services will execute repairs on components and ensure the availability of parts through its large component exchange pool. "We look forward to applying the industry-leading out-of-production expertise of Fokker Services, garnered over many years, to extend the useful life of these robust and reliable Dash 8/Q-Series 100/200/300 aircraft," said Roland Van Dijk, President, Fokker Services. "With Bombardier's support we can further develop the program to the benefit of customers." The collaboration with Fokker is one of a number of steps Bombardier is taking to enhance the operational value of its Dash 8/Q-Series 100/200/300 aircraft. In late 2009, Bombardier launched a life extension program to prolong the economic life of the Dash 8-100 turboprop to a target of 120,000 flight cycles from the original 80,000 flight cycles. The Bombardier Dash 8 or Q Series, previously known as the de Havilland Canada Dash 8 or DHC-8, is a series of twin-engined, medium range, turboprop airliners. Introduced by de Havilland Canada (DHC) in 1984, they are now produced by Bombardier Aerospace. Over 1,000 Dash 8s of all models have been ordered, with Bombardier forecasting a total production run of 1,192 units of all variants through to 2016. The Dash 8 was developed from the de Havilland Canada Dash 7, which featured extreme short take-off and landing (STOL) performance. 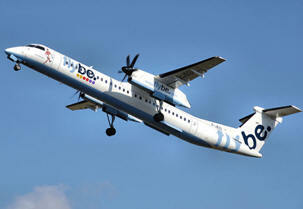 With the Dash 8, DHC focused on improving cruise performance and lowering operational costs. The engine chosen was the Pratt & Whitney Canada PW100. The aircraft has been delivered in four series. The Series 100 has a maximum capacity of 39, the Series 200 has the same capacity but offers more powerful engines, the Series 300 is a stretched, 50-seat version, and the Series 400 is further stretched to 78 passengers. Models delivered after 1997 have cabin noise suppression and are designated with the prefix, 'Q'. Production of the Series 100 ceased in 2005, and the Q200 and Q300 in 2009. Bombardier is considering launching a stretched version of the Q400. Fokker Services is part of Fokker Technologies, which develops and produces advanced structures and electrical systems for the aviation and aerospace industry, and supplies integrated services and products to aircraft owners and operators. The group achieved a turnover of ? 616 million in 2010 with 3,700 employees. Bombardier a world-leading manufacturer of innovative transportation solutions, from commercial aircraft and business jets to rail transportation equipment, systems and services, Bombardier Inc. is a global corporation headquartered in Canada. Its revenues for the fiscal year ended Jan. 31, 2010, were $19.4 billion US.